If you missed this one a few years ago don’t worry, Jimmy the bike messenger Jedi is timeless. These two shorts were lovingly produced by one of our members, Jessica Ruvalcaba. I was honored and delighted to have a personal meeting with the Mayor this week. The Mayor goes way back with LAEV to before he became our Councilman, and we only owned one property instead of four. So it’s always a delight to see how far both he and LAEV have come in the past dozen years or so. I asked if we could take a photo, so I could have bragging rights when he’s our President some day. Here a few of the topics we got to talk about, each of which the Mayor was supportive of. Still a ways to go on advocacy work. But with the help of the “less cars” folks, the permaculture folks, Teresa Baker and her LATCH Collective, Hans Johnson leading the Styrofoam ban, and LAUSD Superintendent Michelle King, and, of course, the passionate folks who live in/at the Los Angeles Eco-Village, it’s all within reach! developments near transit. The City watered this bill down so that developers couldn’t go less than 0.5 spaces per unit. LAEV could demonstrate this for our future developments. Tiny House Villages, legalize them, even on wheels. Hillside terracing, using permaculture techniques for catching rainwater. Styrofoam ban. Let’s do it. Vision Zero. A few additional ideas. Potholes and buses. Best cost/benefits. Let me know if you want a copy of what I recommended about these items. 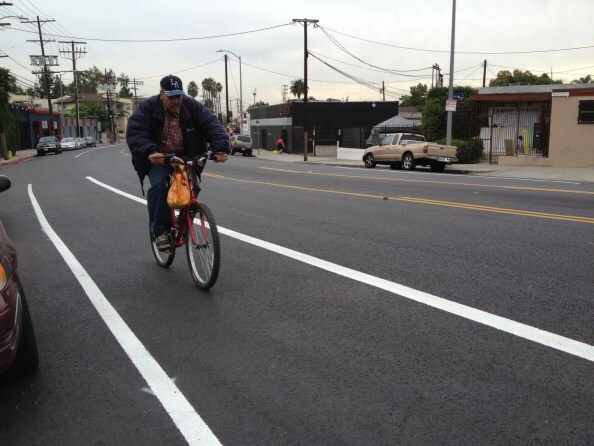 New Bike Lanes on First Street – Along L.A. Eco-Village! There are a lot of bicyclists in Koreatown, but, as Jeff Jacobberger has pointed out, there aren’t many bicycle lanes existing or planned for the entire dense area just west of Downtown Los Angeles – including Koreatown, Hollywood, and Miracle Mile. Over the past week, the area did receive one short stretch of bike lane. It’s about a third of a mile on First Street from Commonwealth Avenue/Beverly Boulevard to Vermont Street. This is immediately north of Los Angeles Eco-Village, and along the southern edge of Virgil Middle School. For what seems like about a half-dozen years, this area has been under construction for LADWP water lines, and then for school construction. Despite construction closing a couple of lanes, as far as I can recall, the street never experienced any serious car congestion. The construction is done, and the street was recently resurfaced. The treatment that was done on First Street is called a “road diet.” The street used to have two lanes in each direction, with few turn pockets. Now it has one car lane in each direction, full turn pockets, and bike lanes. Studies have shown that road diets make streets safer for drivers, passengers, cyclists, and pedestrians. As of this morning, the lane markings appear about 90% done, with crosswalks and bike stencils still to go. At one point in the protracted Bike Plan processes, the city of Los Angeles labeled the Virgil Avenue bike lanes as “infeasible.” Thanks to persistence from local cyclists, including Eco-Villagers, and leadership from then-Councilmember now-Mayor Eric Garcetti (special thanks to Garcetti’s deputy Marcel Porras), the city is now striping new bike lanes on Virgil Avenue from Santa Monica Boulevard to Melrose Avenue – just northeast of L.A. Eco-Village. The new bike lanes are a road diet – reducing four car lanes to three – adding bike lanes and making the street safer for driving, walking and bicycling. They are beginning to build the East Hollywood portion of the city’s bicycle network by connecting to recent bike lanes on Santa Monica Boulevard and are very close to bike lanes on Myra and Sunset. You can ride the new Virgil lanes nearly from the Bicycle District to the new home of the Bicycle Kitchen. Woooot! Woooooooot! Join now-Councilmember Mitch O’Farrell in celebrating the new bike lanes at their grand opening this Saturday January 18th at 9am at Sqirl, 720 N. Virgil. Bike Wash at LAEV Next Saturday! Hey ridazz! Come get your bicycle washed at Los Angeles Eco-Village! For real. It’s a fundraiser for the Westside Invite L.A. – a bike messenger organized bike race, open to all cyclists. The Bike Wash takes place 10am-5pm on Saturday Septmember 1st 2012 at L.A. Eco-Village 117 Bimini Place, Los Angeles 90004. There will be food and drink for sale – come hang out even if you don’t get your bike washed! Bike washes are available at a scaleable cost from ~$10-30 – ten gets you basic cleaning, twenty better, and for thirty: you may need to bring sunglasses because your bike will be too shiny for the unprotected gaze.